Myositis ossificans may have different forms: focal myositis ossificans can represent the fibro-calcific involution following violent trauma, chronic inflammatory processes or suppurative lesions, or it can be the direct consequence of central or peripheral nervous system diseases. Sometimes, it can represent natural evolution of an intramuscular hematoma that calcifies and leads to an ossification process (Fig. 4.55 a-c); the development of these lesions occurs over a five-six months period. In earlier phases, the lesion has an inhomoge-neous architecture and may mimic neoplasia; afterwards, the first calcification appears, mostly on the margins, which is then followed by true ossification (Fig. 4.56). basics of the disease, while skeletal muscle is involved last. 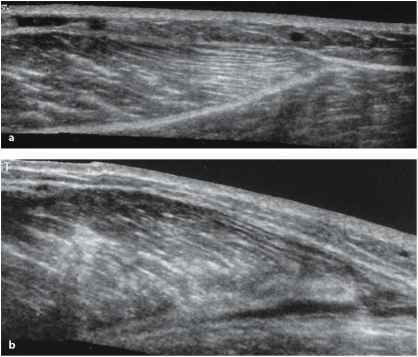 At first, US shows typical muscular inflammation, with reduced echoes within the involved areas; then the consequent fibrous involution causes a hypoechoic appearance (Fig. 4.57) until several ossified foci can be observed in later stages. 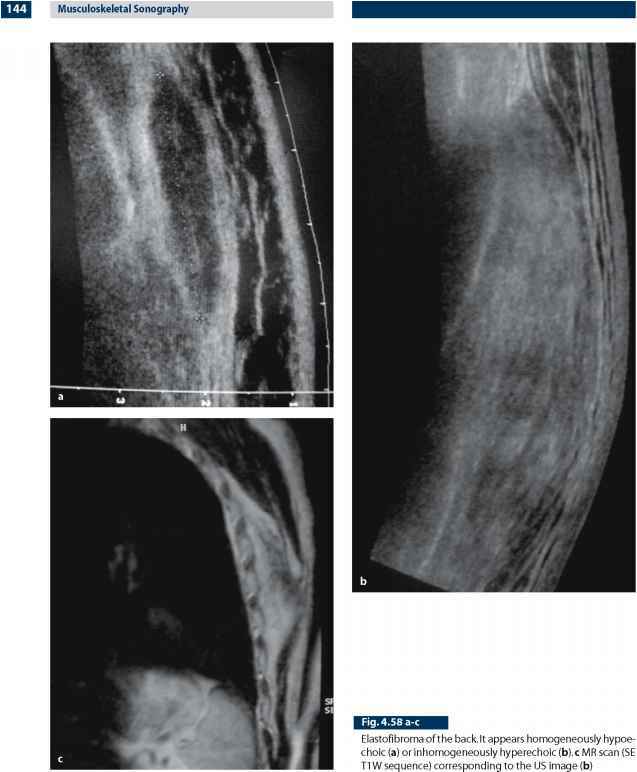 In these cases, other imaging techniques are necessary to understand the exact origin of the bony growths . Polymyositis consists of a group of muscular disorders of unknown origin characterized by an inflammatory process of the skeletal musculature. 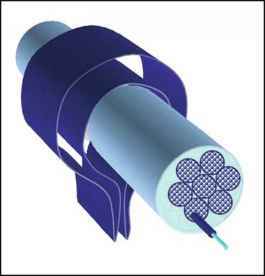 Polymyositis is classified among the systemic rheumatic diseases, more precisely among the connective tissue diseases, and can be idiopathic, juvenile or tumor-related. The main symptom is muscular weakness that mainly affects the proximal muscles of the limb girdle musculature. Several cutaneous symptoms are characteristically associated with this disease. 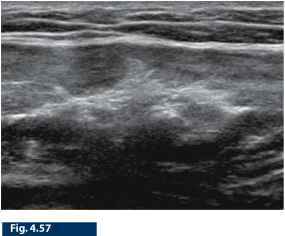 US is helpful both as a diagnostic tool, detecting the muscular degeneration areas and the intramuscular calcific foci, and as a guide to muscular biopsy, which is necessary to definitively confirm the diagnosis . 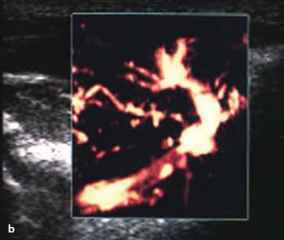 Space-occupying lesions of muscle may arise from the striated muscular fibrocells or from the components of the connective tissue. Benign tumors may be located in one or more muscle bellies and usually have sharp borders, regular margins and homogeneous echotexture. Usually, they do not have an infiltrative appearance but they rather seem to be expansile masses that spread and displace the muscular fibers and the connective branches, leaving them intact. Therefore, the epimy-sium is spared and remains continuous in every part and, upon dynamic assessment, the muscular bellies slide regularly onto the adjacent structures (Fig. 4.58 a-c). Nevertheless, there are some muscular lesions, mostly smaller than 3 or 4 cm, which show benign echotexture, but then turn out to be malignant after histological examination. 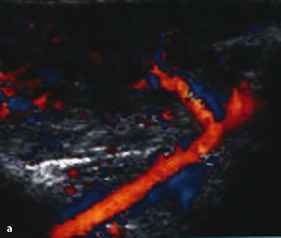 Even though US can provide relevant information about the nature of the neoplasm (fibromas appear hyperechoic compared to the muscle, while lipomas may appear weakly hyperechoic or even hypoechoic), the role of color Doppler is very important, as well as the use of US contrast media that can provide further elements for the benign or malignant characterization of lesions. For instance, a vascular pattern with regular architecture, with one or two vascular pedicles and with characteristic wash-in and wash-out curves (Fig. 4.59 a-c) can lead to the diagnosis of a benign neoplasm [71,72]. The power Doppler scan shows a hypoechoic mass,with irregular contour and disorganised vascular pattern texture due to the presence of anechoic areas caused by necrosis. The epimysium is frequently interrupted and invaded: for this reason, the dynamic assessment shows an alteration of the sliding of muscular bellies on the surrounding structures. 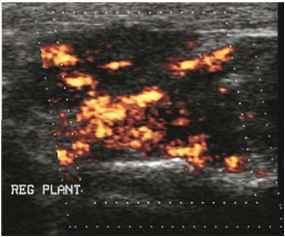 The power Doppler scan shows a hypoechoic mass,with irregular contour and disorganised vascular pattern the original neoplasm and appears retracted on superficial and deep planes. Another cause of muscle tumour is a hyatid cyst which is very uncommon and the ultrasound appearance is the same as in the liver. US is very effective at differentiating cysts, often multiloculated with several septa, from other expansile lesions  (Fig. 4.61). In these cases, US is extremely helpful in performing US-guided interventions. US is extremely helpful in the field of muscular trauma. Within minor traumatic lesions, muscular contractures and contusions are difficult to detect with US, unless complemented with an accurate comparative examination. They are characterized by slight widening of perimysial partitions with hypoe-choic post-traumatic edema. Major traumatic lesions are represented by intramuscular hematoma and muscle rupture. Muscular hematoma is the typical sign of a muscular tear and its dimensions usually indicate the extension of the tear (excluding some hematological conditions). The formation of a hematoma creates dissection of the fascial planes and, if the collection exceeds 100 ml of fluid - as in case of a complete rupture - it must be drained quickly to avoid any compression on the surrounding muscular and neurovascular structures (Fig. 4.62). The evolution of an intramuscular hematoma is not dissimilar to that which occurs in other sites of the human body. A recent hemorrhage has a hyperechoic appearance (Fig. 4.63) but becomes hypoechoic after a couple of hours until a separation between the liquid and the corpuscular phase occurs. When the hematoma is resolving, it appears as a homogeneous anechoic collection (Fig. 4.64 a, b) that can be more or less organized [14,15, 74]. Fig. 4.64 a,b a Deep hematoma at early stage with internal thin septa. b Hematoma at a later stage:the septa appear thicker cular extremities. If direct trauma occurs, the muscle is directly compressed against the underlying bone. US demonstrates an irregular cavity with rough borders followed, a few hours after the trauma, by a hematoma. 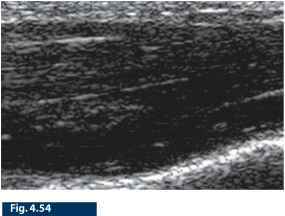 As the lesion heals, US can detect extensive cicatricial tissue that appears hyperechoic and calcific (post-traumatic myositis ossificans). Indirect trauma is caused by a sudden and violent contraction of the muscle and is more frequent in the lower limbs, especially in those muscles that connect two bone segments. Distraction traumas can be divided into three groups, according to their ultrasound features: strain (grade I), partial rupture (grade II) and complete rupture (grade III). Muscle strain occurs when it is stretched beyond its elastic limit. The patient reports acute pain that cannot be distinguished from cramp. The lesions are mostly microscopic but the macroscopic exam can detect several small sero-hemorragic collections up to 6-7 centimeters long and from 2-10 millimeters of diameter. On US, these collections have a stretched and irregular hypoechoic appearance. Healing occurs in about two weeks. Partial rupture (grade II) is a lesion that occurs when the muscle is stretched over its maximal elastic potential. It involves more than 5% of the muscular tissue but not the whole transverse section. In acute cases, the patient reports a 'snap' with localised sharp pain and a complete loss of muscle function that is usually recovered in a couple of days. US clearly shows the discontinuity of the muscle with interruption of the fibroadipose septa, in particular at the myotendi-nous junction, as in the gastrocnemius [14, 15, 74] (Fig. 4.65 a, b). A partial rupture shows three different US findings: a hypoechoic cavity within the muscular tissue, a thick hyperechoic cavity border and the 'bell-clapper' sign, due to small shreds of muscu lar tissue floating in the hematoma [14, 15, 74] (Fig. 4.66). Complete ruptures (grade III) are far less common than the other lesions. The initial clinical presentation is very similar to the partial rupture but the functional loss persists longer and, if the muscle is superficial, the lesion can be appreciated on palpation. 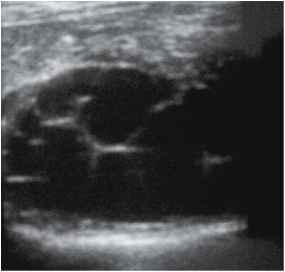 US shows complete dislocation of the muscular ends with a hematoma filling the gap (Fig. 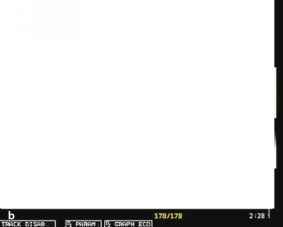 4.67). 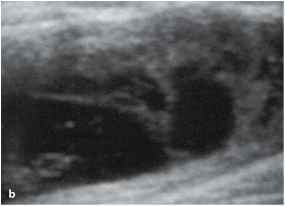 US of resting muscle, normal appearance ly related to the sensitivity of the equipment. Depending on the type and generation of the US equipment, several differences can be observed in the evaluation of the vascularization of the same anatomical region. 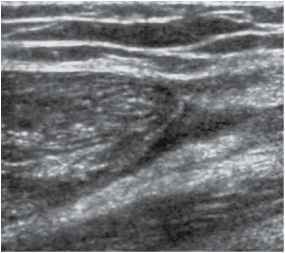 Some recent studies have demonstrated how, during physical strain, color Doppler is able to demonstrate an increase in the muscle vascularization thanks to local hyperemia and to the opening of several arteriovenous shunts, whose purpose is to increase the metabolic exchanges of the involved muscular cells  (Fig. 4.69 a, b). 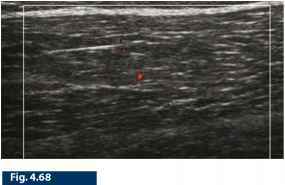 Doppler is not used as a routine analysis during US examination of muscle but it can be used to assess the vascularization of neoplasms. Some recent studies have identified the existence of several vascular patterns which increase diagnostic reliability for the characterization of expansive lesions [75,76]. 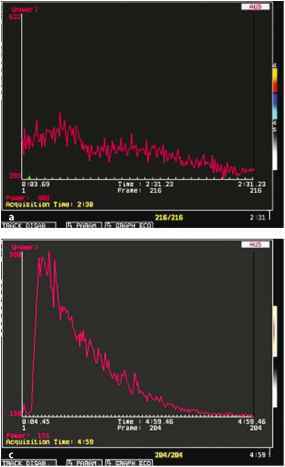 trodiagnostic parameters, such as motor velocity, compound motor action potential (CMAP) amplitude, distal sensory nerve action potential (SNAP), and the nerve cross-sectional area [78,79]. It is conceivable that loss of axons may be associated with nerve enlargement as an expression of increased amount of endoneurial edema. In entrapment neuropathies, the nerve echotex-ture may become uniformly hypoechoic with loss of the fascicular pattern at the level of the compression site and proximal to it. In general, the hypo-echoic changes in the epineurium of compressed nerves occur gradually and become more severe as the nerve progresses toward the site of compression. Depiction of such changes may increase the confidence in the diagnosis and in determining the level of the entrapment. An enhanced depiction of intra-neural blood flow signals can also be appreciated with color and power Doppler techniques as a sign of local disturbances in the nerve microvasculature that occur in a compressive context. Another common pathological condition which represents a peculiar kind of nerve compression seems to be the case of the Morton neuroma (Fig. 4.70 a-c).